The various surgical procedures for cataract removal are demanding and require meticulous and precise microsurgical techniques. Surgery is performed using an operating microscope and microsurgical instruments. Two techniques are currently used to remove cataracts from the eye. One method involves making a large incision into the eye and removing the entire lens. The more common method (termed phacoemulsification) allows for a much smaller incision and is the preferred method for lens removal. This procedure involves placing a small ultrasonic instrument into the eye. This instrument generates about 40,000 tiny vibrations per second to fragment the cataract. The lens material is then aspirated out of the eye. Phacoemulsification is associated with a much higher success rate than older methods of cataract removal. Both techniques involve the removal of the damaged lens material. Artificial lenses can be positioned in the eye in place of the damaged lens before the completion of surgery. Pets usually benefit from cataract surgery with or without artificial lens implantation. 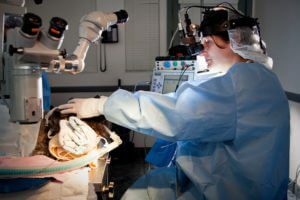 The decision to place an intraocular lens in the eye should be discussed with your veterinary ophthalmologist and may be affected by factors at the time of surgery. Intraocular lenses are often recommended. An intraocular lens can be placed to improve the pet’s vision; however, pets can still see without lens implants. An eye that does not receive a lens implant will be farsighted meaning that objects in the distance are in focus, but closer objects are blurry. An artificial lens restores vision to as close to normal as possible. Lens implants are available at BluePearl Veterinary Partners and are used with routine cataract surgery. In certain cases, instability of the lens or inflammation in the eye may prevent placement of an artificial lens. 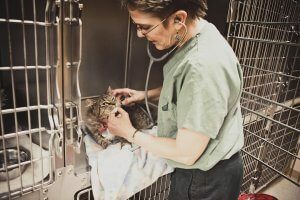 The specifics regarding your pet’s individual case will be discussed by your doctor prior to surgery. The success rate in cataract surgery has improved markedly in recent years with the advent of newer medications and microsurgical techniques. A routine complication is inflammation within the eye (uveitis). This will be monitored and treated by the ophthalmologist. If the inflammation becomes severe it can lead to more significant complications such as intraocular bleeding, painful and vision-threatening elevation of intraocular pressures (glaucoma), adhesions and scarring, and retinal detachment. Every effort is made to prevent complications from developing. However, if they occur these complications could result in the need for additional medications, more frequent reexamination, and permanent vision loss if the eye responds poorly to therapy. There is a very minimal risk of infection in the eye following surgery although every precaution is taken both before and during surgery to prevent infection. Preoperative blood work and physical examination will be performed to minimize the potential for complications during anesthesia.